Beware! This is not "A breezy and highly engaging romp through the rich history of the Canidae," as the back cover promises. It is a highly technical scientific study of the evolution of dogs starting with the first carnivores in North America 65 million years ago, and takes you on a journey with canidae you've probably never heard of like aeturudons and boraphagine, among others. It is of interest to people who are interested in how dogs evolved and why, although it is rather thin on the "why" of canis familiaris, our pet dogs. It may also be of interest to those interested in evolution itself and how examining fossils tells us much about the behavior of the now extinct creatures. It also has an interesting comparison between the felids and canidae, who are far less alike than I ever realized. I was especially interested in how and why such features as retractable claws or short necks, not to mention various kinds of teeth were felicitous for different kinds of hunting and food gathering. This book is pretty cool. The illustrations are really clear and well executed. The text is engaging and understandable. It's not light reading, but it sure is educational! This book presents a good overview on the evolutionary history of dogs (Family Canidae), their phylogeny and their lifestyle.Moreover, It discusses the modern classification of domestic dogs and whether it is a distinct species that is separated from the gray wolf species. To understand this issue correctly, the authors suggest the distinction between two modes of classification of species: Biological Concept and Evolutionary Concept. Based on the biological species concept, gray wolves and domestic dogs are members of the same biological species because they , however live in nature separately, can mate and reproduce fertile offspring in normal cases. Evolutionary concept of species is based on the notion that as long as the domestic dog and the gray wolf diverged from each other in living, they embarked on different pathways leading to different descendant lineages and speciation has occurred.Also the book provides a perfect chapter on the domestication of dog and its story. The dog was the first animal to be domesticated by man before any other carnivore or even herbivore. This makes us think that it was a special domestication story. Self-domestication is one good theory that suggests that the relationship between man and wild dog was at the beginning symbiotic; the dog followed the haunter-gatherer man in their trips making benefits from the food leftover the man leaves behind and, on the other, the presence of this wild animal near the man territory prevent other dangerous wild animal from getting closer.The book contains many figures, illustrations and drawings that make understanding easier and more interesting!If you are interested in dogs and wolves, you will like this book for sure! I was hoping this would have more information about the recent evolution of dogs, but I suppose that book would not be written by paleontologists specializing in ancient dog-like animals. This book was approachable in that each section was concise. 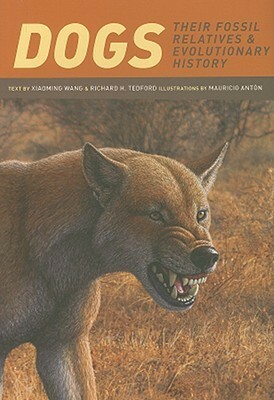 This book was inapproachable in that the word choices were very specialized, and the glossary was not inclusive enough.I did learn a lot about the canine body and what it has evolved to do, but I found myself wanting to learn more about canine-human coevolution and this book only mentioned the most popular current ideas. This book is great for a cursory read about where dogs came from, especially the second half. The first half reads a bit like a list of very similar extinct dog-like species and what we know about them based on their fossilized remains. A thorough and scientific treatment of the evolution of dogs, including the latest thinking on when, how and why they were domesticated. Evidence points to dogs being the first animal domesticated by humans, was it a mutual choice, selection by humans and why a predator? Interesting questions touched on by the bog as well as a good survey of the fossil record so far as it is known. Anyone interested in the evolution of the dog will benefit from reading this book. I almost gave up, but once I got past chapter 3 it was more of pull than a push. It's an interesting look at the various branches of the canid family tree, that like the hominim tree was much 'bushier' in the past than it is today. It was interesting to learn that the degree to which canids have been carnivores has varied considerably over their history, and why dogs have long noses and cats have short ones.